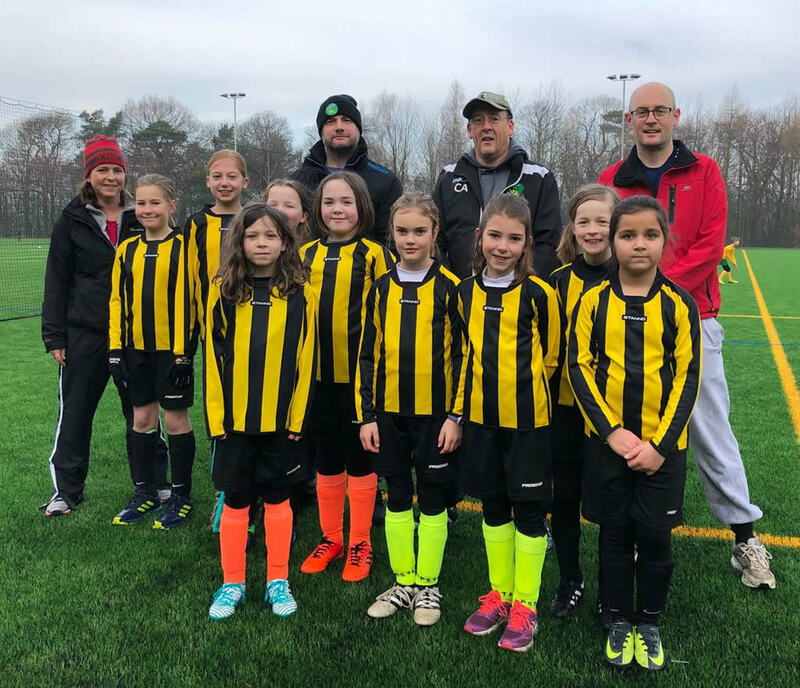 Girls’ football at Langton Green is a work in progress. We know they love to play, and we know we are delighted to have them. What is harder is to figure the best way to do it. Some of the girls want to be treated exactly the same as the boys, and play in the same teams; several do. Others enjoy being part of an all-girls team, and we do that too. 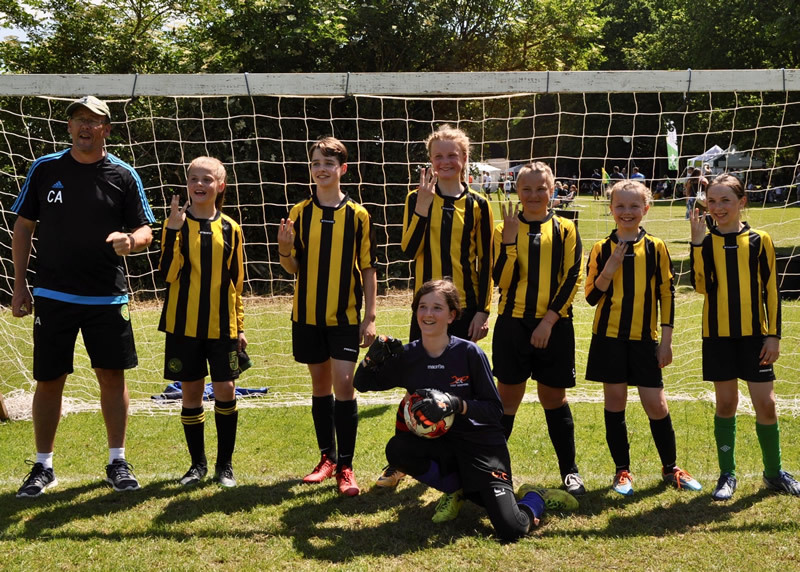 The Langton Green Divas are our girls who are mainly 7-10 years old. They train together on Saturday mornings, and sometimes play against our boys teams. At the Langton Green fiesta in June 2018 the youngest of the Divas managed to win 3 of their 5 games against all-boy opposition! For the fourth year in a row the Belles plunged themselves into an all-boy tournament, knowing very well it could be rough and tough. As luck would have it their first game was against boys from their ow club, Langton Green. The first half was fairly even until just before half time when the Lasers put themselves ahead. But just before the break Abigail F shot home from a tight angle to make it 1-1, and from just being happy to be in the tournament the girls started to believe in themselves. The pitch was surrounded on all sides by spectators who were clearly curious to see these young ladies giving it a go, and all the neutral supporters were cheering for the Belles, which was tough on the Lasers, but understandable. Mid-way through the second half pandemonium broke out as Amy cut inside and shot home to put the girls ahead. The football they were playing meant this was much more than just a lucky break. Gracie came on to join Georgie and Daisy in defence, as coach Chris implored them to defend like crazy and hang on for the win. Amelia had a better idea than just defending and advanced on the right to put in a cross that the defender could only divert over his own line, 3-1. The Lasers pressed hard and Georgie made one particularly crunching tackle that stopped one attack stone cold. Girl power in football boots! The final whistle was met with a whoop that could be heard across all the other pitches. Only 15 minutes later they were back on the pitch against Sevenoaks. The crowd was even bigger as the rumour spread that a girls team had won their first game. Early on Abigail N had to make a great save to keep the scores level, but then the amazing Amy was again the calmest person on the pitch as she shot home. With a lead to protect the Belles scrapped for everything, and always had the speedster threat of Abi F on the right wing. She had given up her place in the 100m in Dartford in order to play (planning to run in the 200m in the afternoon instead!) and was a constant threat. As the clock counted down it looked like the girls might hold out for a win but with 2 minutes left Sevenoaks scored a stunning volleyed equaliser. Chris was begging the referee to blow his whistle and secure the draw, but again Amelia had other ideas as she took a long throw, and Amy volleyed home. It was literally the last kick of the match. After the game the referee said there were 2 seconds left in the game as the ball hit the net. Incredibly the girls had 6 points from 2 games. In the 3rd game against Crawley the girls matched them stride for stride, and Amelia was inches from putting the Belles ahead, before a bit of rough luck when the ball went out of play. The Belles stopped, but the ref said 'play on' and Crawley scored. Chasing to get back in the game the girls conceded twice on the break, but the damage was done by the first goal. In the next match they played an excellent Mile Oak side and did well to stay close until late in the game when tiredness crept in. Things unravelled totally in the next game against Tunbridge Wells when they gave away 3 crazy goals in the first minutes before remembering it was ok to pass to players in the same coloured shirts. After the game the team talk was all about putting that game out of their minds and giving it a proper go in the final match. The coach might possibly have used a rude word or two in his description of the game but because everyone agreed to forget that game no-one can remember what he actually said. The final game of the tournament was the last chance to shine on a blazing hot morning. The girls were determined to give it everything, and did.They came close several times, but Abigail N in goal was also needed to keep them in the contest. As the clock ticked down in the second half the goal just would not come. Then...tragedy, a Hastings score with a minute to go. Game over ? Amy had other ideas and took a shot from the kick off that almost caught the Hastings keeper by surprise, but he tipped the ball wide for a corner. Time to call in the cavalry. Abigail has spent most of her goalkeeping life at Langton Green insisting she can play on pitch. She's hidden the evidence well, or at least hidden it behind her excellent shot-stopping, but up she went for Amelia's corner. With two very tall Abigails both in the penalty area a high cross looked the likely option but Amelia passed the ball in low and Abigail N (goalkeeping Abigail) smashed the ball into the roof of the net. Cue very loud screams from her and several others, whilst her dad broke ther world high jump record watching on the touchline. That was supposed to be it, a heroic last ditch equaliser, and a draw, but no-one had told Amy that was how it was meant to end, so she intercepted the ball, dribbled forward and tucked the shot ball home brilliantly. Some (very noisy) girls on the pitch.....they think it's all over. It is now. 2-1. Just insane. The final whistle came, and the applause for the girls came from all over the ground. Nine points, 3 boys teams beaten fair and square. It was a very special morning. Abigail was as brave as always in goal. Daisy, Gracie, and Daisy rotated the task of keeping the other teams at bay with huge commitment. Daisy discovered over the weekend that she is very good at heading a ball - we knew she could throw it, but this was a pleasant new skill to add. Gracie followed Georgie's lead and learned to enjoy tackling and whenever she and Georgie decide to tackle a boy heading in the other direction that usually ended his progress. Amelia was as graceful as ever, and always capable of shooting from distance (great fiesta haircut too!). Abigail F's pace frightened opponents. But all the girls would agree that the star of the morning was Amy - the best compliment to her was that she was a great footballer who happened to be a girl, as opposed to someone who was 'not bad for a girl'. By the end of the morning the girls had stoppd being stared at just for looking different to all the other teams. They had rightfully earned respect for their football, and done credit to themselves and helped put their club a little further onto the map.